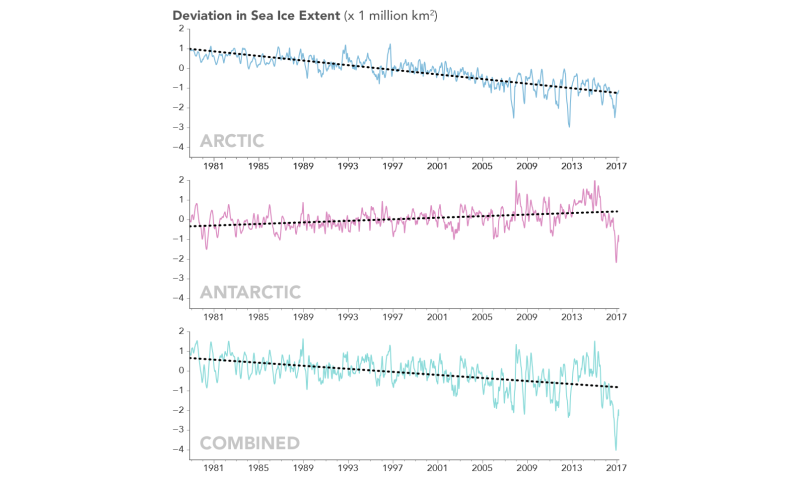 On Feb. 13, the combined Arctic and Antarctic sea ice numbers were at their lowest point since satellites began to continuously measure sea ice in 1979. Total polar sea ice covered 6.26 million square miles (16.21 million square kilometers), which is 790,000 square miles (2 million square kilometers) less than the average global minimum extent for 1981-2010 - the equivalent of having lost a chunk of sea ice larger than Mexico. This winter, a combination of warmer-than-average temperatures, winds unfavorable to ice expansion, and a series of storms halted sea ice growth in the Arctic. This year's maximum extent, reached on March 7 at 5.57 million square miles (14.42 million square kilometers), is 37,000 square miles (97,00 square kilometers) below the previous record low, which occurred in 2015, and 471,000 square miles (1.22 million square kilometers) smaller than the average maximum extent for 1981-2010. "We started from a low September minimum extent," said Walt Meier, a sea ice scientist at NASA's Goddard Space Flight Center in Greenbelt, Maryland. "There was a lot of open ocean water and we saw periods of very slow ice growth in late October and into November, because the water had a lot of accumulated heat that had to be dissipated before ice could grow. The ice formation got a late start and everything lagged behind—it was hard for the sea ice cover to catch up." 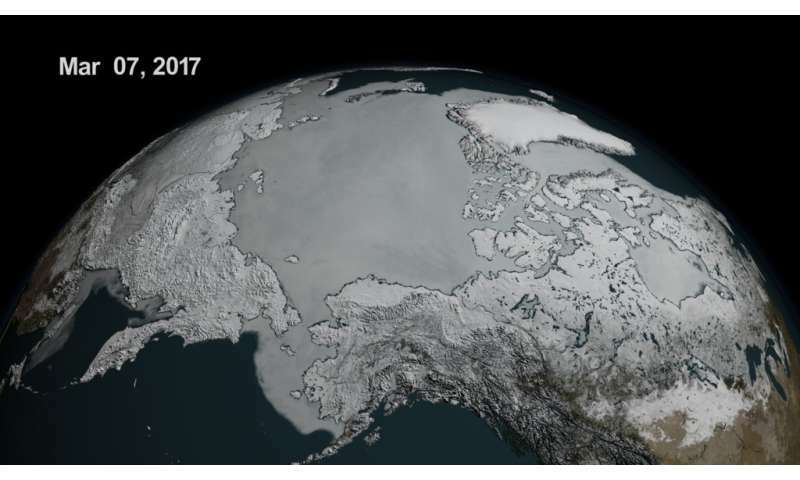 The Arctic's sea ice maximum extent has dropped by an average of 2.8 percent per decade since 1979, the year satellites started measuring sea ice. The summertime minimum extent losses are nearly five times larger: 13.5 percent per decade. Besides shrinking in extent, the sea ice cap is also thinning and becoming more vulnerable to the action of ocean waters, winds and warmer temperatures. This year's record low sea ice maximum extent might not necessarily lead to a new record low summertime minimum extent, since weather has a great impact on the melt season's outcome, Meier said. "But it's guaranteed to be below normal." In Antarctica, this year's record low annual sea ice minimum of 815,000 square miles (2.11 million square kilometers) was 71,000 square miles (184,000 square kilometers) below the previous lowest minimum extent in the satellite record, which occurred in 1997. This year's record low happened just two years after several monthly record high sea ice extents in Antarctica and decades of moderate sea ice growth. 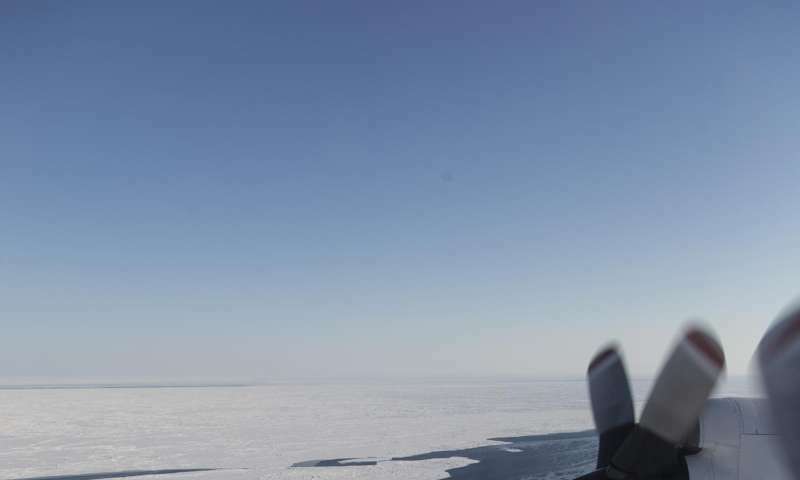 "There's a lot of year-to-year variability in both Arctic and Antarctic sea ice, but overall, until last year, the trends in the Antarctic for every single month were toward more sea ice," said Claire Parkinson, a senior sea ice researcher at Goddard. "Last year was stunningly different, with prominent sea ice decreases in the Antarctic. To think that now the Antarctic sea ice extent is actually reaching a record minimum, that's definitely of interest." Meier said it is too early to tell if this year marks a shift in the behavior of Antarctic sea ice. "It is tempting to say that the record low we are seeing this year is global warming finally catching up with Antarctica," Meier said. "However, this might just be an extreme case of pushing the envelope of year-to-year variability. We'll need to have several more years of data to be able to say there has been a significant change in the trend." The sudden change in the Antarctic is specially disconcerting. It may be too late to stop it, now. No problem. Trumpy will fire the scientists reporting this and save the world. Indeed. It was inevitable; it can't spread out forever without starting to melt. .8% decrease from previous minimum. If you weighed 200 lbs and were trying to lose weight and lost 1.6lbs in a week, would that be a result worth celebrating or mentioning? of course! a 0.8% decrease is still a decrease, and when put in a percent doesn't necessarily sound like a lot, but I would be content losing 0.8% of my weight every week if I were on a diet. The point is that if you keep consistently losing 0.8% of your weight every week, that actual value lost will decrease, but it all adds up. Do the deniers assume all this will just stop at some pleasant climatic spot?